A severely malnourished boy rests on a hospital bed at the Aslam Health Center, Hajjah, Yemen., last month. Malnutrition, cholera, and other epidemic diseases like diphtheria ravaged through the displaced and the impoverished communities ravaged by the Saudi-run, U.S.-backed war. The exposed ribs and hollow eyes of 7-year-old Amal Hussain shocked much of the world when her photograph appeared in the New York Times last month, taken by the journalists who met her in an overworked hospital in the Yemeni city of Aslam, near the epicenter of the long-running Saudi-led, U.S.-supported war that is sparking the world's worst humanitarian crisis. The Times' Declan Walsh reported that the little girl's physician, Dr. Mekkia Mahdi, "tugged on the flaccid skin of Amal's stick-like arms. 'Look,' she said. 'No meat. Only bones.'" 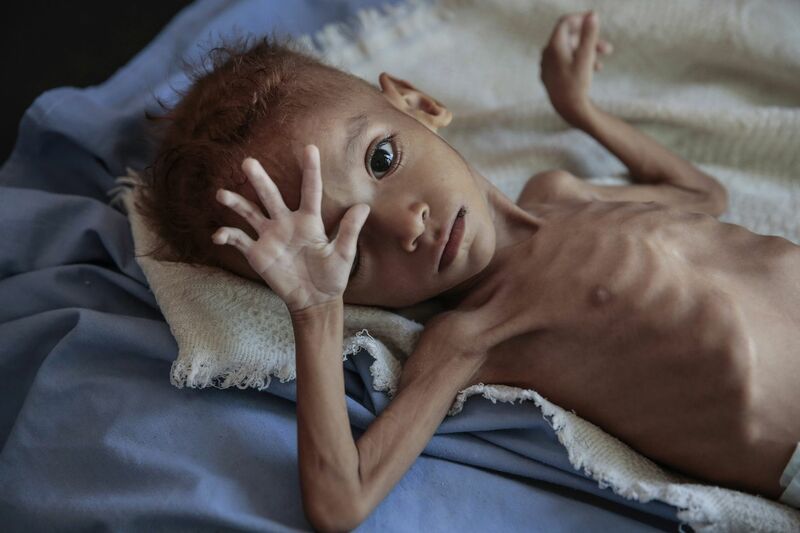 The horrific image of the emaciated, barely alive child brought on a global outpouring, including offers of money for Amal's family and calls for a ceasefire that might end the three-year-old conflict on the Arabian Peninsula. But it was too late to save Amal. The hospital that struggled to control the girl's nonstop bouts of diarrhea and vomiting had to release her to make room for new patients, in a nation where hundreds of thousands of displaced or isolated people are now under siege from disease and starvation. She was taken back to a teeming, disease-laden refugee camp where Amal — the human face of a genocide that the world has yet to come to terms with — died a few days later. A starving Yemini child captured in photos by @NYTimes last week has died. And yet even the pictures of a dying child made next to zero impact in one place that can truly change the dim direction of history: The 2018 U.S. midterm election that comes to a conclusion on Tuesday. Earlier this year, a rare bipartisan effort in the Senate to end American support for the Saudis' ceaseless bombing campaign of its next-door neighbor drew 44 votes — and that was long before the murder of U.S.-based Saudi journalist Jamal Khashoggi made the despotic regime of Crown Prince Mohammed bin Salman (MBS) into an international pariah. A new Congress could play a crucial role in forcing a ceasefire by voting to stop supplying MBS with the bombs, the refueling services, the intelligence, and the other help we've been providing for a bloody, immoral conflict — a move that could force the hand of the pro-MBS Trump administration. But if you've been watching the barrage of TV ads, reading the flyers in your overstuffed mailbox or checking out the occasional debate, America's role in causing a large-scale humanitarian crisis hasn't even been an asterisk in the 2018 midterms. Even worse, the lack of political boldness or even a debate on the Yemen issue has hardly been unique. While some incredibly important issues — climate change, saner gun laws — have seemed surprisingly muted at times in this campaign, other key topics like ending mass incarceration, living wages for workers or an endless overseas war on terrorism barely made even a blip. You've heard it again and again — this year's election is the most important midterm ballot of our lifetime, that nothing less than the fate of democracy is on the line when you finally pull the lever. That's not wrong. But what's striking — now that it's nearly all over except the shouting (which will never end) — is that the Most Important Midterm of Our Lifetime™ was just as mediocre and insipid on the big issues facing America as all the presumably less important ones before it. There's plenty of blame to go around here. At the top of the list, of course, is President Trump — there's a special place in hell (and no, I'm not using that as a figure of speech) for America's distractor-in-chief who has used his choke hold on our attention-deficit media to make 90 percent of the midterm news about his lying and blatantly racist appeals to voter hysteria on the Central American caravan, "anchor babies, transgender people or nonexistent "Democratic mobs." And shame on the journalists who've played along with that. But while it's appalling to see the president totally basing his campaign efforts on fear, it's been disappointing to see too many Democrats embrace a campaign style that seems fearful, or at least too bland for the dangerous moment we live in. For most of my adult lifetime, the national Democratic establishment has played it way too safe, so after a decade in which the party lost more than 1,000 seats nationwide, of course they would double down on that dubious strategy. No matter where you live in the United States, the ad that you saw for your local Democratic candidate probably centered on one issue: health care. And make no mistake: If you're going to pick just one issue to run on, it's a good one. Not only is it a matter of literal life and death that affects every family in some way, but many incumbent Republicans practiced a form of political hari-kari in voting for bills that would have cut off insurance for pre-existing conditions, a feature of Obamacare that currently ranks just below "free beer" in voter popularity. Focus-group approved, the Democrats took this and ran with it — but with little else. — A living wage and other steps to attack runaway income inequality. Polls — even this one taken by the pro-business, anti-wage-hike National Restaurant Association — show that roughly 70 percent of American voters not only believe that America's federal minimum wage needs to be increased but that they wouldn't mind paying extra when they go out to eat to make it happen. Congress hasn't raised the federal minimum wage of $7.25 — one of the world's stingiest — since 2007, and yet you've heard next to nothing about this tailor-made political issue. — Ending mass incarceration. Voters who supported lock-'em-up crime laws and candidates in the 1980s and '90s have increasingly come around to the idea that America's system of mass incarceration is immoral, ridiculously expensive and generally unsustainable. This notion has played out in urban DA races across the country — most notably Philadelphia's 2017 election of Larry Krasner — but also has surprising support from Republicans like Jared Kushner and the Koch brothers. So why the lack of focus in congressional and state legislative races? — Afghanistan and America's "forever war" against terrorism. It was somewhat jarring on the Sunday morning before the election to learn that the mayor of a Utah town — North Ogden's Brent Taylor, the father of seven — was killed while serving in Afghanistan, possibly an "insider" assassination by a member of that nation's security forces. America has been fighting there since 2001, nearly as long as some of this year's voters have been alive. The 2018 election would have been a good time to ask American voters if we're OK with a perpetual war. But no one really asked. — Fixing democracy. Read the op-ed section of any American newspaper almost any day, and you'll probably see an opinion piece about the threats posed to democracy by everything from an Electoral College that elects minority presidents to gerrymandering to the gutting of the Voting Rights Act to the public's lack of confidence in our election systems, etc., etc., etc. Yet these concerns haven't translated into a bold political agenda. Why not? To be clear, this isn't a blanket indictment of every campaign. Some candidates — Democrat Jess King, running for Congress in east-central Pennsylvania, leaps to mind — are out there with bold and more consequential platforms. But these exceptions throw the general timidity of the 2018 race into sharp contrast. The Democrats are so certain that a) not being Donald Trump, spoken softly and b) swinging the moderate-sized stick of keeping Obamacare (a promise they know they can keep) will be enough to retake the House on Tuesday. They're probably right. But voters have a right to ask how much a "change" election is going to change the problems in their everyday life, like shrinking paychecks, or a loved one behind bars. Even in the face of Trump vetoes and GOP filibusters in the Senate, let's hope that House Democrats use the next two years to vote on a much more ambitious agenda than the one that many of them campaigned on, and thus set the stage for 2020. It will come too late, of course, to save Amal Hussain. Hopefully it won't come too late for American democracy.